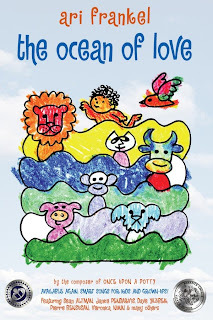 The Ocean of Love, the award-winning CD by Ari Frankel, is back! When the album was f irst released it was rather limited ... meaning it was printed privately and distributed to friends and Frankel's growing fan base. Well, now he has re-mastered the album, designed new adorable packaging and has secured distribution making the effort available everywhere good music is appreciated and sold. I happen to be a fan of stuff for children. Correction, I'm a fan of good stuff for children. A lot of people insist on providing children with annoying drivel that only serves to warp a growing child's musical taste buds and get on parents nerves when their kids insist on listening to it for the five million and forty-seven thousandth time. Frankel however doesn't fall into this category. He has put together a record full of catchy, educational, non-annoying songs that are fun and don't insult children or their parents. Frankel, a cross-genre artist covers many bases with this record. The songs offered up allow children to swim in the waters of pop, jazz, reggae, folk and Latin giving them the opportunity to sample the various genres without being heavy handed about it. The breezy reggae tinged "The Ocean of Love" brings to mind lazy days on the beach building sand castles with your favorite little one while "Drivin' U.S.A. is a number reminiscent of the Beach Boys and "Change Me" is rather Beatlesque. Anyone who knows me might find this a bit odd as I'm not a fan of Latin music, but, my favorite track on the album is the Latin flavored "Hug You." If you have a little one in your life, The Ocean of Love is certainly a record to include in their music collection. what do you think, that it’s easy to be a kid?